The scraper batch queries news.google.com, outputting a table of returns including URL, title, source, date, teaser text, and thumbnail image, . Enter sources to be queried (optional, one per line, e.g. www.nyt.com), a set of key words (one per line) and a project name for the results file. Select desired number of results per query (default is 100, as greater numbers require multiple scrapes). In the advanced options you can also set a date range for your query, amongst other things. Optionally, the scraper retrieves thumbnail images attached to each search return. Discover uses of "security fence," "apartheid wall" and "security barrier" in news media, outputting a table. Select all, and paste special in MS-Excel. 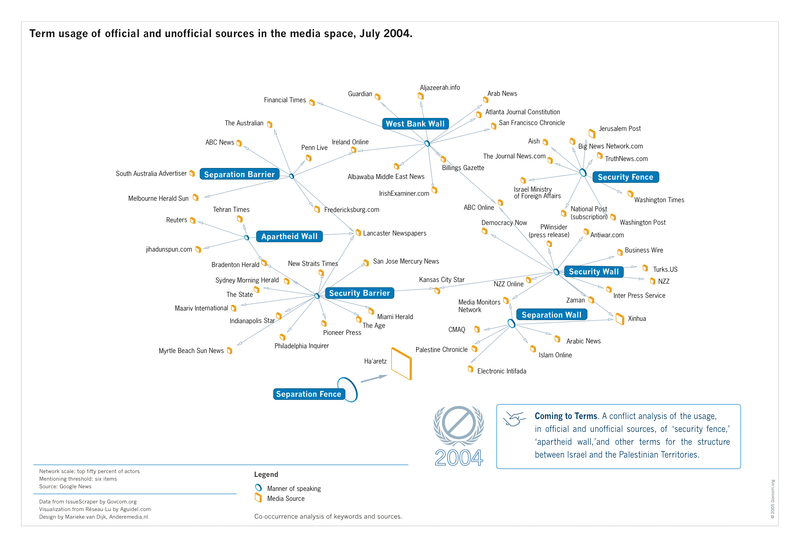 Results may be visualized in a number of ways, including the following network diagram showing associations between terms and media sources.